"Catherine Cardinal distills over 20 years of wisdom gained from counseling real people into a delightful easy-to-read book that prepares the reader to move surely and confidently to joy and success"
"Catherine Cardinal gives her readers the ability to change their lives by accessing their own wisdom. It is a rare gift!" The book garnered the privilege of being on The Los Angeles Times Healthy Best Seller list for five weeks and The Bodhi Tree's best Seller list for four months! 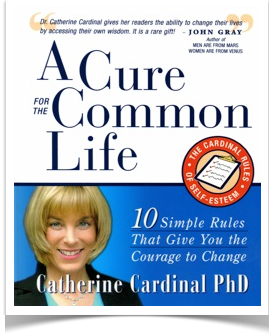 A Cure For The Common Life: The Cardinal Rules of Self-Esteem is a small but deceptively powerful book that pinpoints 10 specific ways to recognize the root cause of common problems and, at the same time, determine a realistic course for improvement. Taking the steps to change can be an overwhelming struggle unless you become aware of the key issues that strengthen your self-esteem and empower you with the courage to break free from the old habits that hold you back. Written in a clear, thoughtful, all-embracing, heart-to-heart style, Catherine Cardinal, Ph.D.'s book gives you the confidence and support to finally take that giant leap – and change for your own good. Click here to learn more about Catherine's coaching, one-on-one & phone sessions. Attention Single Ladies (AND Men)! Catherine Cardinal, Ph.D. CRC, is getting exceptional results in teaching women how to get what they want. Her skills are based on over 22 years of private practice and ladies, she CAN tell you what you are doing wrong and get you on track. She can help you sift through the profiles on the Internet and weed out the ones you don't want to waste your time on. And she can teach you how to know within one to two dates whether someone is full of BS or a true and real possibility. There are SKILLS to dating and most women have not learned these skills. Catherine knows them and can help you improve your track record. HEY FELLAS! There are skills for you, too! Have you met the woman of your dreams? Are you an eligible, sincere guy and tired of having your heart broken? Let Catherine help you to recognize the women who are worth investing time and money on and those that are not. Save yourself some heartache—learn the skills! Every man has a potential for inner and outer greatness. Catherine has seen how men can be stifled and stunted in their personal growth by being with the 'wrong' women, women who emasculate them by putting them down and draining their energy. She has helped many men get clear on their choices and discover their deepest sense of purpose and masculinity. She UNDERSTANDS men and what they need and can teach you to be more effective in every area of your life.